Congratulations! You win 80 bonus points with this purchase! 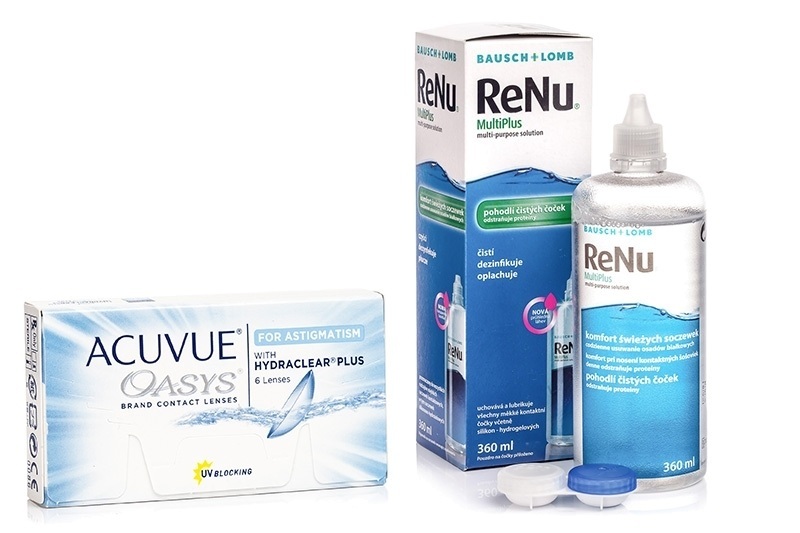 We offer an economy pack for fortnightly contact lenses Acuvue Oasys for Astigmatism (6 lenses) with ReNu MultiPlus 360 ml solution. A new generation of astigmatism correcting contact lenses that combine visual stability with the exceptional comfort of HYDRACLEAR Plus technology. The result is consistently clear vision and a smooth and silky feel – even for people with an active lifestyle. Acuvue Oasys for astigmatism are made from silicone-hydrogel, are exceptionally breathable, block most UV rays, and have a visibility tint for easier handling. The Acuvue Oasys for Astigmatism with Hydraclear Plus contact lenses can be worn continuously for a week and then discarded, following your optician's con­firmation. If worn for a week continuously, they must be discarded, if worn during the day only – can be worn for 2 weeks.